Happy New Year's Eve to all, and I hope you've all been enjoying time off school and work during the preseason. On the other hand, you're all likely gearing up for Season 8's solo queue grind, and for those of you that have been out of the tryhard mode for a while, check out my personal top 10 picks going into Season 8! Soraka - As a support main, I'm a big fan of Soraka. She's one of the only champions left in the game with a true global, and the instantaneous nature of her ultimate allows her to greatly impact other lanes without leaving her marksman's side. This gives Soraka immense pressure after she hits level six, and allows her to "pressure" lanes just by being alive. Leona - Where Soraka shines as an omnipresent being, Leona shines as a point of attack. If you combine her with the precision tree secondary, she snowballs incredibly hard and is very difficult to ignore or lockdown. When you couple her defensive nature with her immense damage, trades are almost always in your favor and there's really not much more you need to think about other than see hero, kill hero. Nasus - Some players say that games snowball too fast for Nasus to be useful. While it's true that on games that end under 20 minutes he only has a 50.8% win rate, this is still impactful and continues to rise as the game goes on. Tailsman of Ascension is also incredibly good on him, and allows him to reach his potential much sooner. The nice part is, he also has relatively few hard counters, and even his worst match-ups hover close to a 50% win rate. Illaoi - Illaoi is one of those champions that can really win the game all by herself. While you don't want to first pick her in case the enemy team decides to go Heimerdinger or Kayle, her overall lane power is intense and she scales up very well with Kleptomancy. Meanwhile, even if you do fall behind as a result of jungle ganks, her ability to annihilate enemy teams with a single well-placed ultimate is legendary. Rammus - This is by far my favorite no-brainer jungler out there. 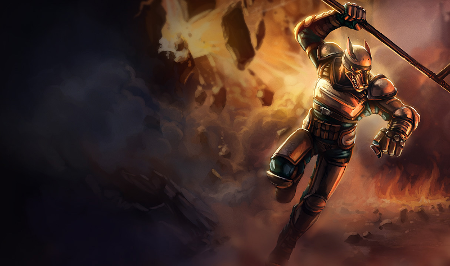 His gank potential is hard to mess up, and the number of Yasuo/Zed mains out there make him an easy pick. When you play Rammus you really get to focus on the intellectual aspect of jungling. Late game, flashing onto a marksman and 100 to 0ing them with a point and click spell is fun too. Shyvana - Shyvana isn't specifically a gank-based jungler, but she does pretty much everything well. Her damage is incredibly high and she does have engage/AOE damage, so it's really up to the player whether they want to split-push, farm, or team-fight. Luckily, Shyvana does all of them really well. Miss Fortune - Long-time readers of Nerfplz know that Miss Fortune is by far one of my all-time favorite marksmen. Her ability to one-shot enemy laners via a single double-up is extremely obnoxious and difficult to deal with, especially against lower division players. Meanwhile, her ultimate makes her one of the few marksmen ultimates that can safely 1v5 a team from behind a wall...and win. Ashe - Ashe is another one of those low skillshot, high pick-potential champions that can be effective even from a losing position. Her ultimate and hawkshot give her immense utility and mean that to be effective, she doesn't need to snowball. All she has to do is survive and shoot her ultimate. Malzahar - See hero, kill hero. Malzahar is one of the easiest mid-laners by a long-shot, and his pick-potential allows him to win games all by himself. Enemy teams also seem to be allergic to quick silver sash at lower divisions, which makes him essentially a free win. Heimerdinger - I struggled a bit when trying to think of another mid-laner that was so utterly easy that anyone could do it. Heimerdinger's damage is crazy high, he can push without worrying much about ganks, and the new runes give him a free early game Zhonya. While he doesn't necessarily work as well in higher divisions, getting to gold or platinum with Heimerdinger would just involve putting down turrets and staying alive. It's really that easy. Got more champion picks you think would go well on this list? Comment below!